Yesterday, out of the blue, Thomas Lee Elifritz, an engineer (not a scientist, as we discussed with regards to creationists) decided to go crazy on one of my posts (actually my second one here), with some fairly uncivil commentary (I had to block one of his posts because it made me, who has the language of a Navy petty officer, kind of uncomfortable). He came to complain about one of my edits on Wikipedia. Now technically, Wikipedia takes seriously any off-Wiki harassment and threats from editors. Since this website tracks IP addresses of commenters (thank WordPress, I don’t care at all), I could contact the Cabal that controls Wikipedia with this information. But I just don’t care that much. His comment, “I assume you are the prick you edited out the latest Younger Dryas Impact paper from Kennett et al. from its wikipedia page. Heckava job there, bozo,” didn’t exactly make him out to be very intelligent nor respectful. 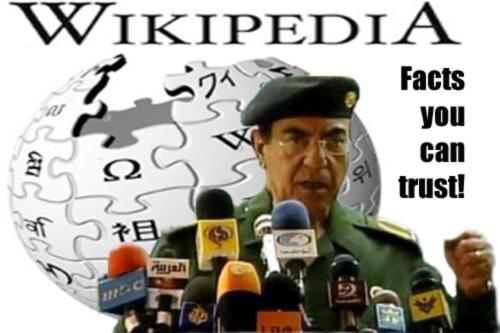 In addition, it was very cowardly of him not to bring the discussion to Wikipedia where it belonged. I guess he prefers harassment here than civil conversation on Wikipedia. Before I continue, let me give a little background. I love editing Wikipedia, even if it’s frustrating and mostly run by amateur kooks and crazies. Don’t even get me started on the incompetence of most of the administrators (those individuals who lack any type of serious academic training and think that if someone writes “homeopathy is scientifically supported”, it is obviously supported by science). Wikipedia is a messy anarchy, where a group of Brownshirts, even if well-meaning, try to instill order in a totally random and illogical manner. There are some outstanding articles (including Homeopathy), but mostly the articles are about Pokemon characters, pseudoscience, and whatever pop phenomenon is happening at the moment. My edits on Wikipedia usually follow when I’m writing an article here, and my research leads me to the Wikipedia article and I get annoyed by something and fix it. On this blog, I’m only really interested in evolution and vaccines, with occasional branching out to other fields of pseudoscience. I am planning articles on global warming, GMO foods, and other silliness like colon cleansing and Android v. iOS. OK, maybe not the last one since people get really personal about their cell phones for the strangest of reasons. I mean it’s clear that Android users are sociologically deficient, and probably are possessed by aliens. However, I have two interests that are far outside of my formal education in biology, pharmacology and biochemistry. The first is European history, more specifically, English history from the fall of Rome to Elizabeth I. But I’m fascinated about all areas of history and archeology, and I believe I’ve reached advanced amateur status. My second fascination is geology, partially since its related closely to evolution, and partially because the evidence is all around us. I spent days in Lassen Volcanic National Park in the far northeastern part of California, just hiking around glacial remnants, mudpots and other volcanic features, and standing next to 15 meter high snow falls. Impressive. Back to Tommy Lee. His immature response was because of some edits I made to the article, Younger Dryas impact hypothesis. Without going into too many details, it was a hypothesis that some sort of comet or asteroid impact struck the ice sheet covering North America, about 13,000 years ago, which lead to the death of the megafauna (mammoths, sabertooth cats, and whatever else lived in North America). I ran across the article because I was reviewing some information about climate change from the last glacial maximum to now. I’m not that interested in the megafauna of North America, but I wanted to know more about the impact hypothesis, since I’m sure it was on the History Channel right after one of their ghost/alien/sasquatch crap shows. A few years ago, several researchers brought out this hypothesis, which, in a few years was mostly (if not totally) debunked. The article had a few problems. First, it claimed it was a scientific theory, which it wasn’t, even if there was some evidence. A theory is the top of scientific principles (as opposed to what creationists believe). A scientific theory describes what has happened and allows a scientist to predict what might happen given a set of conditions. It is developed from the scientific method through data, analysis, repetition and publication. It is repeatedly tested through new observations and experiments. Often a theory is developed through consensus by a large number of scientists. A theory is essentially a fact. A hypothesis, on the other hand, is a proposed explanation of a set of observations. It’s probably the lowest level of the set of principles for an observation. I corrected that error, while also stating that the hypothesis had been large discredited. It has been, and most scientists have moved on to other explanations for the megafaunal extinction 10,000 years ago. They also claim that there were huge fires across forest and plains, which would definitely happen after a bolide impact, but also could be caused by other factors such as drought. Furthermore, it would be impossible to determine if the evidence support one continuous fire in one small period of time, or support several fires over a decade. But in fact, there isn’t any evidence that supports there were even a series of small fires, let alone a continent-wide one. They make a claim of a “black mat” seen in a few locations in North America (many near ancient shorelines). Sometimes, this “black mat” could indicate an extraterrestrial impact, but more often than not they indicate a megatsunami or even more mundane things. Scientists need to be enthusiastic about their work to succeed, but when this enthusiasm clouds judgement in favor of pet theories, then the science produced will inevitably be poor. The best science is often produced by scientists able to reject their own preferred theories (which also has the advantage of saving them the embarrassment of somebody else doing it). In an era when evolution, geologic deep time, and global warming are under assault, this type of “science by press release” and spectacular stories to explain unspectacular evidence consume the finite commodity of scientific credibility. This is why the creationist Republicans who are trying to force religious teaching in schools think there are controversies out there. We have one group using real science for data, publishing it in real journals, and discussing it civilly, and on the other side, we have…ad hominems. I’m all right with calling anti-vaccine lunatics, ummmm, lunatics, because they don’t use real science, just pretending to do so. Ridiculing homeopaths or creationist is a time-honored tradition, and again, there’s no science. Usually discussions involving real science rarely devolve into name calling. There’s a debate these days on the mechanics of evolution (not that evolution exists); it’s a matter of one highly ethical group of scientists trying to find consensus with another group. There might be some angry comments, but I’ve never read one side calling the other “pricks” because they have debunked some piece of science. My edits on Wikipedia were done in good faith, based on peer-reviewed articles from respected journals. I have no emotional involvement with the article (it’s not like life or death is at stake, as opposed to medical articles) other than to be technically correct on the usage of “scientific theory”, and to delete anything that has been debunked by scientific consensus. Furthermore, Wikipedia professes to be “neutral” and expects a Neutral Point of View for all edits. It’s not what you believe or think is a fact, it’s what can be supported by evidence. It doesn’t mean that all evidence is equal, some are just better than others. For example, a Homeopath might take an article in the Natural Journal of Medical Water as their evidence, it’s not equivalent from something written by Cochrane Reviews. I bet my readers were seriously bored by this article. Sorry. Actually, the Younger Dryas climate event is quite fascinating to the understanding of human evolution and climate change. Previous PostPrevious Why do Americans hate Gardasil?